The new school building was opened on October 30, 1899. It replaced the original school building that was built in 1866, shortly after the Township of Frankfort bought the one acre plot for $5.00. This 20 X 40 one room school house is the last remaining (unaltered) school house in Pepin County Wisconsin. 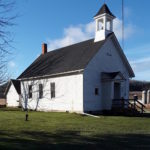 The Little Plum School operated until July of 1957, it was then purchased by the Little Plum Lutheran Church and used for meetings, 4-H groups, art tours and other events. Rick and I are planning on preserving this historic site for future generations. This upcoming year marks the 120 anniversary. Happy Birthday Little Plum School!